and this is a recent article Published in Business Standard, India, January 30, 2018. Small, sustainable and serene, SOS Organics workshop in the hills offers salvation of a kind to the locals it touches, writes Anjuli Bhargava. If your conscience is clear, your wish will be granted. That’s the faith that guides many travellers as they stop to pray at the Chitai Golu Devta temple in Uttarkhand’s Pant Gaon. The temple road is overrun by brass bell vendors – bells are sold by weight – as people make their way up to reach salvation. Very few visitors would be aware that a short walk from the temple road would take one to a spot that offers salvation to several families in the village – only of a different kind. The leafy entrance to SOS Organics and the beauty and calm that envelops you once you are inside is hard to describe. A calm that emanates equally from Amrita Chengappa, 47, and Santosh Thomas Hoehne, 66, the two founders and Osho sannyasins, who left their old life behind to build a green and sustainable enterprise that maximises what nature has to offer. Started in 2002, SOS grew organically. It started in the basement of a rented house and slowly different units (construction was managed locally) were added as and when funds were available, after the duo bought the land it currently inhabits. Everything SOS produces is in sync with nature and packaged like a work of art. Its range covers organic and handmade soaps and natural cosmetics, rock salt lamps, a range of aromatic herbs and seasonings, health food including gluten-free flours and grains, teas and body and massage oils. Sale is primarily through the SOS website and Himjoli (an aggregator and seller of local Uttarkhand products). The outer façade of the structure has been converted into a work of art by Italian artist Jivan Camoirano, who did three months of painstaking work – sketch, scale, prepare and finally paint the walls. The carefully constructed and beautifully run workshop – calling it a factory is an insult – has two floors: the cosmetics unit and the food processing unit. In every room, a few neatly dressed women are huddled over their workspace. 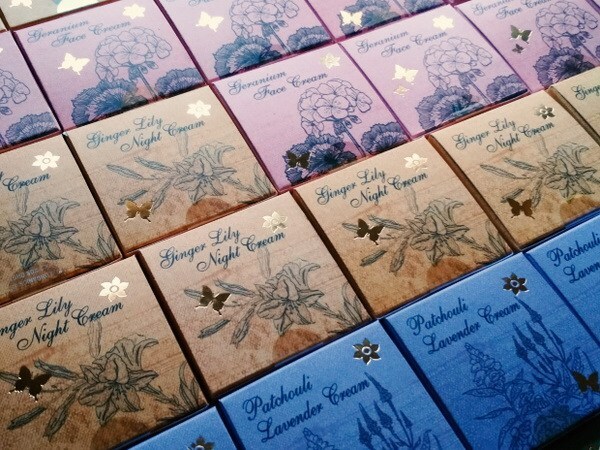 There’s a room with neat racks full of handmade soaps – a mingling of fragrances greets you – ready for packaging. In one corner of the room, there’s an attractive array of packaged cosmetics in delectable boxes that captivate you. The floor above has a few ladies sieving and sorting grains. There’s a separate area with some of the latest technology to ground the grain into flour, ensuring no mixing. When they say gluten-free, they mean gluten-free. SOS takes as little from its surroundings as possible and gives as much as possible. At the centre of the property – between the workshop, the library and the private spaces – are three enormous water tanks brought in from Jageshwar. For the past seven years, rain-water harvesting has been perfected to an art as well and now 200,000 litres of rain water are harvested every year, stored in tanks and used when required. So, the property has no regular Jal Nigam water supply pipeline whatsoever. Solar electricity is produced but due to a large number of trees – which they refuse to cut – their exposure to sunlight is limited. But a recent addition within the property has given them a sun-rich spot so the next aim is to cut the electricity supply from the village and be self-reliant. The products they offer are centred on what grows in the vicinity. Indigenous inputs – stuff that grows right around them – is what they use. “No trucks bringing inputs from the plains. No hybrids. 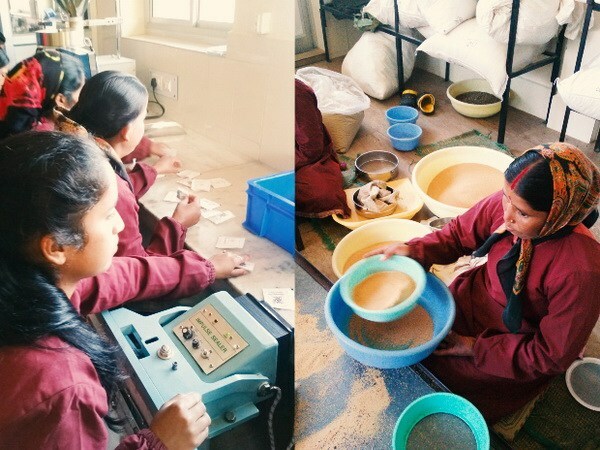 The idea is to use traditional knowledge to produce products suited to modern India,” explains Amrita. So there’s a nettle cream and seasoning unique to them, a vast range of Himalayan grains like polenta, jhangora, foxtail millet, puffed amaranth, amaranth-based flour, fragrant red rice, white soy, village brown rice – most of which are unavailable in regular shops. Everything is organically grown and locally sourced. The philosophy that guides SOS is E. F. Schumacher’s Small Is Beautiful: A Study of Economics As If People Mattered. So, SOS is not to be an endlessly growing entity. At no stage do they propose to have trucks coming up and down carrying stuff for them. Santosh says that the whole idea is to show that it can be done and then to serve as a model for others to replicate. “One can produce a thing of beauty, help others, seek nothing from your surroundings and sustain yourself,” he says. Disruption is minimised even in the lives of the women they hire to work. Although SOS employs a few men, the majority is women as they are “so efficient, industrious and sincere.” Moreover, the women have no other avenue to earn a livelihood. Work shifts are six and a half hours a day with an hour for lunch. All employees walk to work. The 20-odd workers are paid well above the average wage in the region, with a starting salary of Rs 9,000, a mini fortune in the area. The worker and her family members are medically insured. “The idea is that working at SOS should not disrupt their way of life in anyway. So for instance if someone at home is sick, they can simply take the day off. No questions asked,” explains Santosh. Himjoli’s CEO Pankaj Wadhwa says that a job at SOS is highly coveted in the village – “More than what they earn, it’s how well they are treated by the two employers that makes all the difference.” Although Santosh, a Bavarian-German by birth, has renounced his earlier life and identity, his roots clearly show up in the attention to detail, the scientific bent of mind and the understanding of technology and machines. With his experience as the head of finance to Rajneesh and the Osho movement, SOS manages to balance its books and generate a profit on its annual turnover of Rs 12 million (Rs 1.2 crore) that is both shared with employees and reinvested. it is posted by Aditi Dixit and published on 1st of August 2016.